Lokelani B-204's sun balcony with direct oceanfront views and quiet sandy beach. Sunsets framed by the islands of Lanai & Molokai taken from B-204's lower lanai. 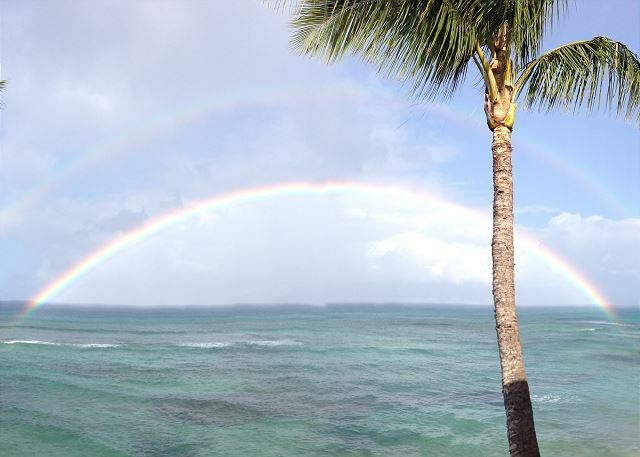 Spectacular Rainbows from your balcony almost every day! Master Bedroom view from private sun balcony. Lokelani B-204's main balcony with spectacular ocean and private beach views. These could be your footprints on Lokelani B-204's sandy beach. Even Double Rainbows! This photo was taken with from the main B-204 balcony. Outside dining for 6 plus high top table & chairs for whale watching & sunsets! Spacious master bedroom with new tropical furnishings and a private sun lanai. 40 inch flat screen TV and a leather swivel recliner for reading and relaxing. Over-sized Master Bath with spacious walk-in shower plus granite and marble tile. Large new full Bath between Bedrooms with bamboo cabinets and lots of storage. Separate dining area between kitchen and Living room. Large guest bedroom with Queen bed and elegant tropical furnishings. Updated Guest bedroom with 32' flat screen TV and views of West Maui mountains. Large gourmet Kitchen with full size appliances and ensuite washer & dryer. Spacious Kitchen with granite counter-tops and just steps away from ocean views. Large Kitchen fully stocked with everything you need to cook for at least 8. Spacious 1,117 square foot floor plan not including lower or upper balconies. Flat screen TV and elegant tropical furnishings throughout the condominium. New full Bath with walk-in shower and marble tile on main floor. Full bath just off Kitchen with all new fixtures and marble tile. B204 is a premium direct oceanfront townhouse with two spacious bedrooms, two full baths and two large lanais (balconies) that offer 180 degree water views! This quiet 1,117 square foot townhouse features a well appointed master bedroom with a king bed, a guest bedroom with a queen bed plus the unit has a queen sleeper sofa so the condo can accommodate from 2 to 6 guests comfortably. B204 was recently remodeled with top of the line granite, marble, tile, carpet, blinds, appliances and furnishing including a 46” Flat Screen TV and vintage artwork. Lokelani is a hidden gem offering all the comforts of home in a private tropical oceanfront setting. Bedrooms are upstairs offering lots of privacy. Effective on May 1, 2015, B204 will have AC throughout the whole condo!! On arrival, Friday, we were moved to another unit due to the fact that the unit that we had booked was undergoing repairs. That unit was definitely not as nice as the unit we rented #202B. We were finally able to move to the unit we rented on Sunday. That unit was beautiful and we enjoyed everything about our stay there! The grounds were very nice and the staff was friendly and helpful. The sea turtles that come up on the beach daily are awesome, and the sunsets are beautiful! Mahalo for staying with us and thank you for your understanding with having to be relocated temporarily. Interesting with the scare of hurricane but it had a wonderful time. We loved Lahaina! The condo was perfect for the 6 of us. The view is everything pictured except that the water was right up to the rocks and so you had to go to the beach behind the condos next to you, not right in back. But that was ok. This was a great location! if your wanting to have great pool, this is not for you. It's a small pool in the parking lot. But, we didn't go for a pool, we came for the fabulous snorkeling, sightseeing, and some great shopping in old Lahaina. Loved having air conditioning, this is a must in August! Loved eating breakfast on the Lanai with the amazing view and the amazing sunsets at night. The manager was very nice and accommodating. It had everything we needed except a cooler, but we left the one we bought for others to use. We felt safe, it was clean and overall loved it! We didn't care for the beach towels provided. They were small like a bath towel and scratchy. Grateful for the washer and dryer. Thank you fro staying with us and taking the time to comment on how we an improve. Yes the size of our beach changes with surf and tides, the sand moves up and down from our property to the next property. Our rental property at Lokelani was most impressive! It was very clean, and well stocked. We enjoyed our coffee on the lanai each morning, along with the beautiful weather. And we thoroughly enjoyed watching for the green turtles that swam by. Everything about our stay was exceptional, and we can’t wait to return! We highly recommend Lokelani!!!! We just returned from a great week @ Lokelani. Location and condo were perfect for 4 of us. Comfy king bed, A/C, and amazing views 24 hours a day (even the moonshadow on the ocean was spectacular). We are so glad you enjoyed your stay. Please come see us again! We had an incredible time at Lokelani Condos! The view from the lanai's is exceptional! We would sit each day and just listen to the waves. Turtles would swim by each day and entertain. You can spend a lot more money other places and not get anywhere near the view. Condo was well furnished and clean. If we make our way back to Maui we will stay here again. Most of the people who were there while we were there were repeat visitors. Our stay at Lokelani Condominiums was even more than we imagined it could be! Right on the beach; whales, dolphins, and honu were our companions and entertainment every day we were there! AC was wonderful to have. Beds were perfect, with high quality linens. Office staff were very helpful. We are already planning another trip next year...we have a new favorite vacation location! Thanks for making our Hawaiian dreams come true! Mahalo for staying with us and we look forward to having you as our guest again. Love this location! We were traveling with another couple and the layout of this condo worked well for the 4 of us with 2 bedrooms and 2 bathrooms. We loved watching the turtles and whales from our condo balcony. We met such friendly quests at Lokelani during stay. We can’t wait to go back!! WE had a great vacation and wish we could had stayed longer. The Condo was everything and more that we wanted. The views were amazing..and we could watch whales from our balcony. Love it!! We had a lovely time at Lokelani B204. It was beautifully decorated and very spacious. Seemed to have all the kitchen ware you'd need although we did not cook anything, just reheated leftovers. Great ocean views from the master bedroom and family room. Quiet beach and complex. We would definitely stay there again and/or recommend to friends or family. Had a wonderful time in Maui at Lokelani-B204. The apartment was updated and very modern. Excellent location with beautiful views from both balconies. The air conditioning worked great and we were close by to everything we needed. This was a wonderful apartment and would, without hesitation, stay here again. Thank you for staying with us and we do hope you will return. Our condo was right on the ocean! It felt like we were on a ship that wasn't moving because sitting on both the lower and upper lani, we could see only the ocean and Molokai! Almost every day a rainbow and many days sea turtles on the private beach. The condo has been updated and furnished very nicely. There are two bathrooms, however, the bedrooms share a bathroom upstairs and there is a small bathroom downstairs. It worked fine for us as we had family there, but two couples may not like that aspect. Also, there is no walking beach, but just down the road about a mile is a long beach to walk on. The management was very helpful and attended to any questions or services we needed. We visit Maui every year and this was the best location ever! We also love the Elvis show Burning Love! If you are an Elvis fan, go see it....Darren is fantastic! Thank you so much for staying with us. We hope you will return to Lokelani. 5 minutes to Kaanapali, 10 minutes to Lahaina, and 30 feet from an essentially private beach, this apartment is in an excellent location. It was rather warm when we were in Maui this summer so having a/c throughout the apartment was a godsend. I would give this place my highest recommendation and I can't wait to go back. Thank you very much for staying with us. We look forward to your return. Our vacation was exactly what I was hoping for and much more! Beautiful condo and setting with all the admenties! We enjoyed snorkeling trips to Molokini and Lanai, a hike through the bamboo forest, many days at the different beaches, and a wonder Luau at the Royal Lahaina. Our favorite restaurant was Bubba Gump. The staff at Boss Frogs (where we booked our snorkel trips and rented snorkel gear) were very helpful in making our trip memorable! The condo unit was more than big enough to accommodate us (a family of four for the first week and there were 5 of us the second week) and well equipped with everything we needed including laundry. The location was perfect and the views from the unit were amazing. I didn't expect the beach to be as nice as it was in the end after all of the beaches we visited it remained one of our favorites. It was a great place to stay with a family. All of the neighbors were very respectful. I highly recommend Lokelani and unit B204. I would not hesitate to stay here again. Thank you for staying with us. We hope to have you and your family back. Our condo was beautiful. Plenty of space and privacy. The neighbors were very friendly. It was overall a must do again! Great place! Loved our stay! to see sea turtles right off our balcony! The views of the sunset and sunrise were breathtaking! We would definitely recommend this place to others and would definitely stay again!! We loved these condos and had such a wonderful time with our family. The condos are right on the water, where turtles loved to visit. Our kids ages and 3 and 1 enjoyed the pool and beach very much. This was our third time to Maui and second time at Lokelani. B204 is a lovely two level condo with AC, which is difficult to find. It's well appointed, comfortable, and has everything you need. Lokelani is in a terrific location close to grocery, restaurants, and beaches. We introduced our brother-in-law and sister-in-law who also fell in love with the location and view it offers. We all agreed it was difficult to leave, and we can't wait to go back! Thank you for staying with us. We hope to see you next year. A view I would love every day. Well equiped and very clean apartment, Liz in the office was super helpful with any queries we had. Watching the turtles come onto the sand each night mere steps away was magical. Perfectly Clean, Comfortable...and the View!! Unit B204 was perfect for our family of 4. And the unit was nicer than expected as the kitchen cabinets and countertops have been redone since the ad was placed. There was no direct beach acces like the pictures suggest, but there is a perfect swimming beach next door that we had access to. Not the greatest snorkelling but swimming was great...and safe for my 12 year old. Tons of turtles! The 3 times that I have been to Maui, I haven't seen as many as this trip. Management was wonderful to deal with, location was good. Short walk to some take out type restaurants and an ABC Store, and only a 15 minute drive into Lahaina. And only about a 10 min drive north to Kapalua Bay which was the prettiest bay to swim with superior snorkelling. Overall, I give this unit a 5 out of 5 and if I return to Maui I would definitely stay here again. Amazing location and very spacious. The interior is a little dated but the location and view are why you're there anyway. We'd go back for sure. We had a wonderful stay at Lokelani. The views were amazing from the condo. We saw turtles everyday from our lanai and saw some whales too. There was very good information about the beaches in the binder at the condo. The management provided us with all the amenites one would need for the beach. They were also very accommodating with our special request. Will come back again ! This was our 3rd year in a row staying at Lokelani. We stayed in B 204. Located about 30 feet from the water, there is a small beach to relax on while swimming. The water is shallow and there is some ok snorkeling right there. Pool is small but nice. Rarely more than a couple people using it. The staff is great to work with. We needed a few minor things looked at and Liz took care of them right away. Love that the complex is now NON-smoking! Our 2 bedroom condo has 2 private lanais with spectacular views. The condo itself is nice. The carpet is starting to show its age a bit, but still good. The king bed is comfortable and the linens are nice quality. The kitchen is stocked well enough to take care of you on a relaxing Hawaiian vacation, even has a Kuerig, which we did not use. The blender, however, worked great.... every day!!! The complex is off the road, somewhat secluded, so it is very quiet and relaxing. Several nice places to eat close by. Will definitely be visiting Lakeland again next year!! Fantastic condo, right on the ocean, accommodated 4 adults and 2 children comfortably. We are happy you enjoyed your stay and hope you return soon. Couldn't ask for more!!! AMAZING!!! Propane grills for bbqing and the kitchen in the condo has fully stocked with anything you could need! This was the vacation of a lifetime. Never in my dreams would I believe I'd be staying right on the water and literally watch multiple sea turtles swimming in front of me on a daily basis. The location was perfect. Incredible sunsets, semi private beach. I would Love to stay in this unit again. I would recommend they fix the deadbolt on the door for safety issues to make the guests feel safer going to sleep, or going out for dinner etc. It just doesn't work at all so we had to make sure what few valuables or cash was taken with us at all times, which can be cumbersome when you just want to go snorkeling. Took one star off cuz of the deadbolt. That's important. The view was unbelieveable, the turtles were so much fun to watch. Snorkeling was very good right in front of condo (beware of coral). The inside however really needs to be upgraded. We had 2 remotes for 3 TV's. The dishwasher hit the cabinets, The utensils/pots and pans need to be thrown away. someone could really pour about 10-15K into that place and make it really nice inside. I don't know how you get closer to the water than this condo. Fantastic. We stayed at this location in May of 2014 and came back again for vacation April of 2016 because it is absolutely heaven on earth! We enjoy that it's a smaller condo unit. It is as Ocean Front as you can get. And the views are breathtaking. You can snorkel, paddle board, and swim in the waters directly in front of the units. The 2-bedroom / 2-bath units are spacious and well stocked. I would return to this location time and time again. Life doesn't get more perfect than when I'm in Maui at Lokelani. View was as pictured, inside of clean, bedrooms were nice, good updates on the bathroom. Our place was quiet and did not hear neighbors to the right or left of us. Would have been nice if the deadbolt worked and that we could have locked the sliding glass door as the person below us was broken into during our stay. Very clean, stocked, convenient, and location was absolutely perfect! I wanted a stay away from the busy town yet close enough if we wanted to drive into town(simple 5 minute drive)! We will come back for sure! Everything about this place was awesome. we needed a short stay to visit friends next to Westin and Lokelani had a hole to fit us into. they were very nice and flexible in the booking process. The unit needs better fry pans and spatulas but had everything else needed, except soap and shampoo. The view on the ocean was amazing. very nice unit. The condo was nice and had ample room. The view and location were absolutely wonderful. The only thing negative is that the pans for cooking in the kitchen were not very good. The condo was exactly as described. Beautifully updated kitchen and bathrooms. Plenty of towels and sheets. The condo owners anticipated most of our needs. We appreciated the supplied cooking equipment, the few kitchen staples, laundry detergent, etc. A bonus was the washer & dryer. I did not recall it in the description, but may have forgotten. Nonetheless, it was a nice surprise and very useful. The view was amazing! We enjoyed coffee on a lanai each morning and wine every evening as we watched the sunset. The ocean was probably 20 feet in front of the condo - beautiful! We saw sea turtles swim by a few times. We stayed in late-Oct - a little too early to see whales. Although the beach was not directly in front of the condo, it was only a few steps away - that was not a problem at all, even with 3 kids. The beach is shared by a few condo units, but there were never many people on the beach. It was nice to have a semi-private beach to play on. The location was great. Although it is on the northern side of the island, the location wasn't a hindrance at all. Very close to Kaanapali and Lahaina, and only about 45 min from Kihei and Kahului. Overall, we greatly enjoyed our stay at Lokelani! Set just north of beautiful Lahaina, this Condo was an amazing place to stay for our Honeymoon. There is a beach just to the side of the condo, that we enjoyed. The snorkelling is decent, but there are so many excellent spots close by. If your a fan of snorkelling make sure to pick up "snorkel Maui" by Judy and Mel Malinowski. It is a very well written snotkelling book from some locals. The bed was so comfortable with good pillows and bedding. Waking up to a beautiful view of the ocean as well as SEA TURTLES banging up against the rocks down below. Both my wige and myself have only great things to say about this beautiful Condo. The location of the unit was super. We had previously stay at a facility just down the street and knew the area. The unit was very well equipped and the ocean view was magnificent from both floors. As a senior person hauling heavy suitcases up several flights of stairs was a problem. The door lock was in bad need of replacement. We were pleased and enjoyed our stay. We love Lokelani and look forward to returning. The daily superb sunsets were amazing. We saw turtles every day! Our condo was clean and had everything we needed. Kim, was very helpful with all of our needs. We would love to keep this place a secret but know it is not possible. it was our first trip to Maui, to walk into the beautiful condo and see the ocean right away every day is memorizing. We loved to fall sleep to the sounds of the ocean and wake up in the mornings and enjoy our coffee right on the porch with a view of the Sea turtles swimming with their babies in the ocean right in front of us was a memory we will never forget. We were very pleased with this condo. They had beautiful Hawaiian details in their decorating, the bathrooms and kitchens had beautiful upgrades, and we loved the view of the ocean from the lanai. We also really appreciated the AC! Closest Condo to the Ocean! Four of us stayed in this beautiful condo. Plenty of room. Two balconies. Perfect view of the ocean and islands!The A/C was exceptional. We snorkeled with the sea turtles right in front of our unit. Only problem was parking. One car per condo unless prearranged which we did. Parking lot Nazi on weekend duty threatened to call tow truck...he must not have gotten the "prearrangement" memo. We called manager but no one answered so had one car parked on the street a mile away! It was stressful until Monday when the manager came in and fixed everything! Excellent pre-visit communications from condo staff. Checked in and out seamlessly. And, there is a "resident turtle" who came ashore daily to pose for photo ops; tho' we were careful not to disturb the creature. As youngsters we spear fished regularly in the waters off these shores. Mahalo for taking care of the environment. Malama! Beautiful stay at B204. The views are EXACTLY like the photos. Jaw dropping oceanfront. Charming lanai with great seating. A/C worked great in bedroom. Great layout for 2 couples. Condo was equipped with everything you need. Granite kitchen with lots of workspace. Totally remodeled bathrooms with tiled showers. Beautiful sunsets right out front. Small beach area is good for a quick swim. Nice proximity to Lahaina, but feels tucked away. Kim is great to work with! Absolutely everything was provided in this condo in order to ensure a stress free vacation. Not only were the accommodations beautiful, comfortable, and clean - we also saw turtles and whales from the lanai on our very first day. The location of this condo was perfect; nestled right in between the bustling little city of Lahaina and the beautiful beaches and snorkeling coves further north. Definitely go to the Farmer's Market, and check out all the little restaurants that surround this condo. Me and my family will definitely be coming back! We couldn't be happier, and honestly couldn't think of a single thing that would have made our stay more enjoyable. Units were big and spacious, there was no need for AC. When your 27 ft from the ocean the breeze and sounds are enough. Renting anything unseen can add some anxiety to even a well planned vacation, but our condo at Lokelani was everything we had hoped it would be. The upstains lanai was a great spot to sit with coffee and watch the sunrise come from behind the building onto your own private beach, and our second day there we saw 3 whales breach all at once while we were sitting on the downstairs lanai. The condo was well appointed, and Kim (Residence Manager) has SO much of the "Maui spirit" from the initial contact to our arrival - I think she may have invented it! Our unit did not have AC but in March, the fans offset that need. Beyond that, I cannot think of any way to improve the amenities offered at Lokelani. Mahalo!! From my first phone call 8 months ago, our Lokelani experience has been absolutely wonderful! Kim is so helpful with reservations and also has great ideas about experiencing Maui. The complex is off the road a ways, making it a secluded treasure. The condo was immaculate! Everything we needed for our stay was there. Well stocked kitchen, washer and dryer, nice towels, and a nice welcome basket. I'm not sure there are any condos closer to the ocean. The views from our lanais were amazing. Sunsets, turtles, even a couple whales. Breathtaking! I spoke with several locals and they all said Lokelani was among the best on the island. 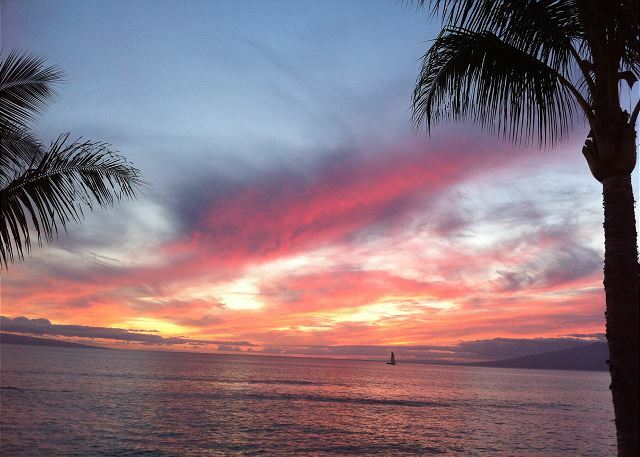 Being about 10 min from Lahaina is a perfect location, close to everything you'll need. I will strongly recommend Lokelani to anyone heading to Maui! We are already planning our return! Very convenient location to lots of activities. 5-10 minute drive to fabulous dinner locations and sporting acitivites, shopping, etc. Walking distcance to markets and good eats. The view was a million dollars and the beach below was very nice. This condo was amazing! We felt like locals. The views take your breath away and the furnishings are up to date. Saw several turtles swimming by in the mornings. They supply several fans due to no A/C and they assisted in keeping us cool. We went in early October and temperatures were not high and we were only there in the evenings. Definitely coming back! This is an amazing place to relax. The views are spectacular from the living room and the master bedroom. The condo is beautifully decorated. I would definitely come back to stay at this place. I was a little concerned as I picked the condo for our first family vacation to HI. But it was perfect-all the little extras-cooler, beach towels, dishwasher and laundry supplies and the sea turtles swimming out front! a guest from OLYMPIA, Washington does not recommend this vacation rental. My husband, 2 teenage daughters and I stayed for one week in B204. We liked the condo a lot. It was very spacious and the owners showed good taste in picking out tiles and granite of good quality. The refrigerator is large, which is necessary if you are planning on cooking and storing fresh food and cold drinks. The furniture is starting to show a little wear but the beds are very comfortable. The temps were in the 80's and we did not miss an air-condition with the nice cross breeze other than on one day after a rain fall where it was really humid. The view is great, no doubt, and the top balcony is great for watching stars at night. Be aware that the hot afternoon sun is shining unto the lanais and there are no umbrellas. We could not sit out there in the afternoon without getting fried. One thing we found inconvenient were the access to the beach. During the beginning of our stay the surf was quite high and you had to try to race between waves across the steps to get to the beach. Keeping towels or a camera dry was tricky and I worried about twisting an ankle not seeing the last step under water. As much as we liked the condo, this lack of "own" beach will keep us from choosing another condo the next time we visit Maui. During low tide it is no problem to get to the beach, during high tide you have to wade through water and during rougher surf you will battle waves. Kaanapali is situated nicely, close to good beaches and Lahaina. You will need a car! Traffic was not that bad.